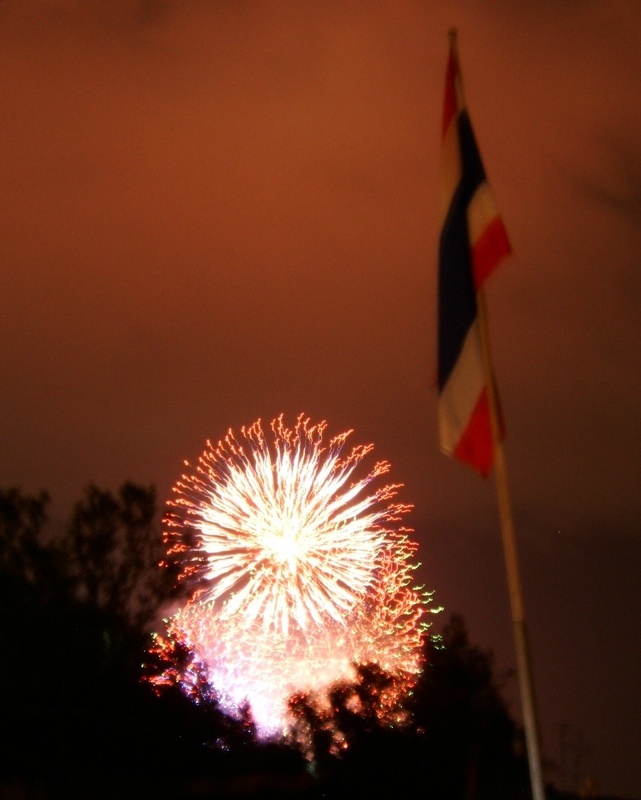 Friday the 9th was His Majesty the King’s (yes, I realize I’m saying that as if I were Thai – When in Rome, do as the Romans) sixtieth anniversary on the throne. In addition to a massive celebration for the public staged at and around the Sanam Luang parade ground across from the Grand Palace, the Royal Thai Navy completed the final dress rehearsal of the Royal Barge Procession that will be performed for His Majesty and visiting dignitaries (including royalty from twenty nations) on Monday the 12th. Tickets for the official viewing stands sold out weeks ago, but after a little exploration I found a promising vantage point: there was a small crowd waiting outside the gate for the old Internal Trade Department offices, which are slated for demolition. Joining the crowd to wait, there were ticket holders who were allowed through the crowd, and there seemed to be the promise that the gates would be opened after all ticket holders had arrived. A few times while waiting, vehicles pulled up and slowly eased through the crowd, police officers holding back the crowds while the gates were opened just sufficiently to allow the vehicles through. Finally, though, the momentum of the crowd gathered and the officers were unable to hold us back as we pushed the gates open. I was filming as this happened, caught up in the tide. Honestly, I was a little worried because I didn’t know how the officers would react. There were several seconds of heightened alertness as I waited for shots to be fired. Thankfully, there was no violence and the officers finally conceeded to the forces of nature, no longer straining to hold back the human tide. The situation on the banks of the Chao Praya River was quite good: the crowd was large and the land was flat, so views were a little less than ideal. 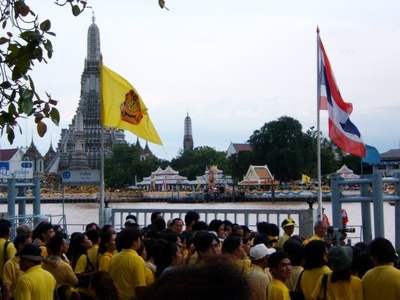 But we could see the whole river before us, from the ancient spires of Wat Arun (the Temple of Dawn) to the Royal Thai Navy Harbour Department further upriver. 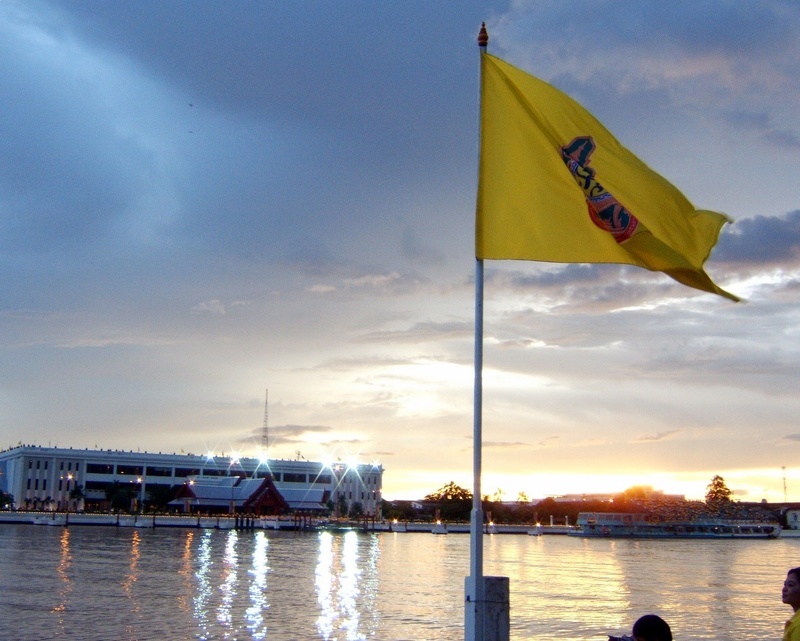 Heavy clouds threatened rain and blocked the sun and the breeze kept us comfortable. 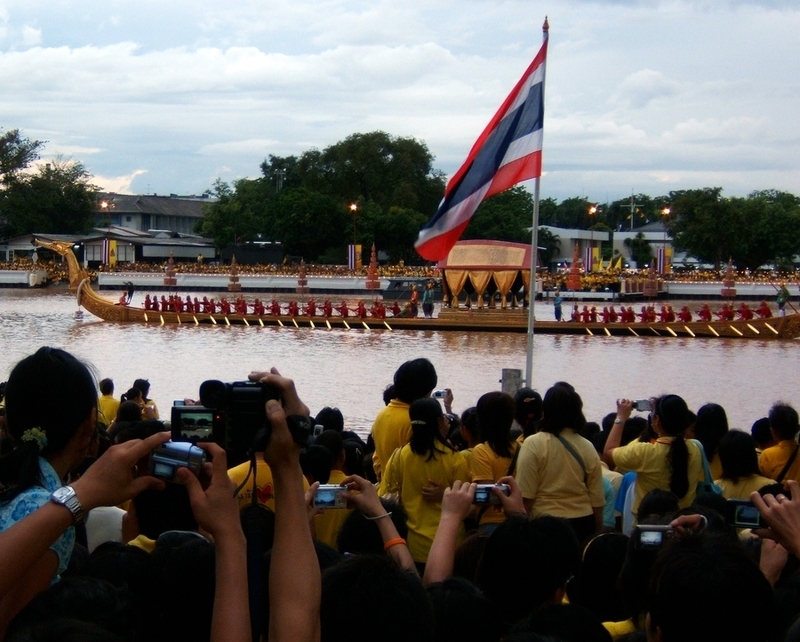 As the first barges slowly moved past the crowd, the air was filled with the haunting echos of the chanting used to keep the rowers synchronised, a reminder that instead of just being a tourist spectacle, this is an ancient and extant tradition rooted in the religion and culture of the Thai people. The final barges in this 1.2-kilometer long procession glided past some 45 minutes later as the sun sunk into the western horizon. Slowly, some of the crowd headed back toward Sanam Luang. Others stayed by the river, reflecting on what they had witnessed. It was evident by looking at the crowd, almost all Thai and many of them mature adults, that they had a deep appreciation of the moment and the importance of the occassion. Below is a large (19mb) video segment that shows highlights from the procession. It will give you a taste of the experience. After the procession, some of the sailors were walking back upriver in their full dress costumes. People in the crowd stopped them, asking to pose with them for pictures. The sailors, many of whom come from poor families in the countryside, didn’t seem to know what to do with all the attention but gamely posed for the pictures as long as anyone asked. 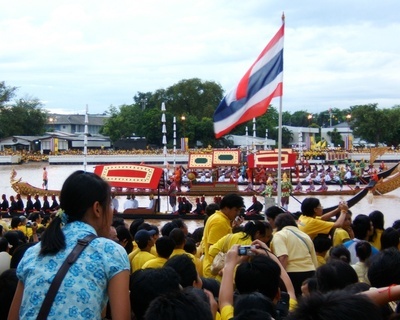 In addition to the barge procession, there were festivities occurring throughout Rattanakosin Island (old city). 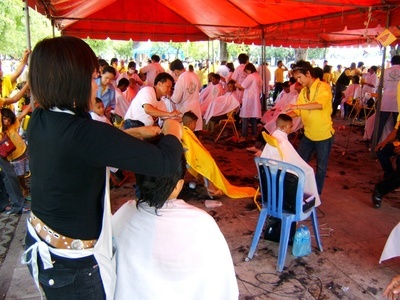 During the day there were displays and activities, including free haircuts as part of a employment program His Majesty had established. This is one of many different schemes he has set up to assist the least fortunate of his subjects. 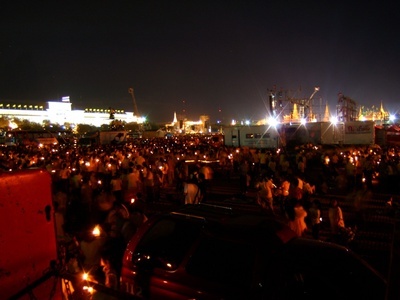 In the evening, there was an event at Sanam Luang with three large, rock concert-sized stages. 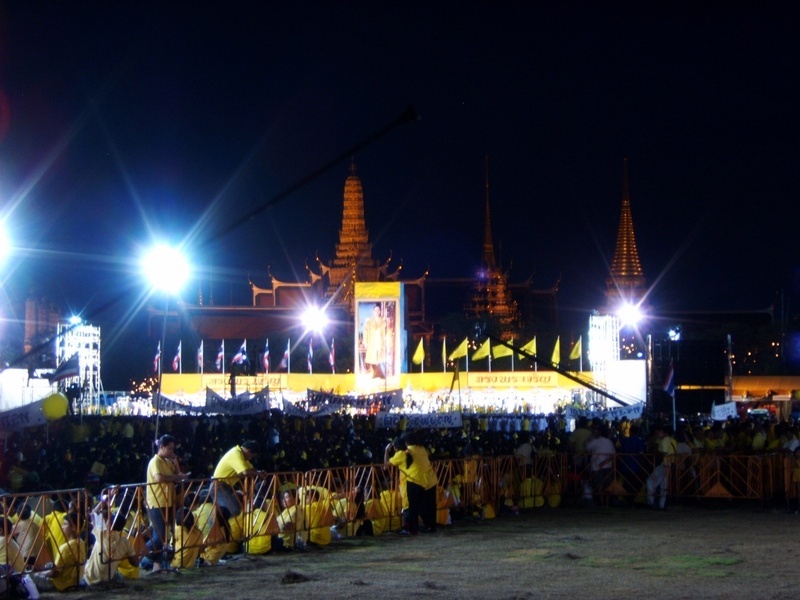 Frist there were speeches and then a candlelight ceremony at 19:19 (7:19 pm), a auspicious time for the ninth king of the Chakri dynasty. The King’s Anthem was played and the entire crowd – I would estimate between 300,000 and 500,000 people – sang the anthem as they held the candles high. The entire length of Thanon Ratchadamnoen – purposefully designed by King Rama V in the style of Les Champs Elysées in Paris – from Sanam Luang past the Democracy Monument to the Metal Palace at Mahakan Fort – was packed with people. Only a single lane of traffic was able to creep along in most areas. 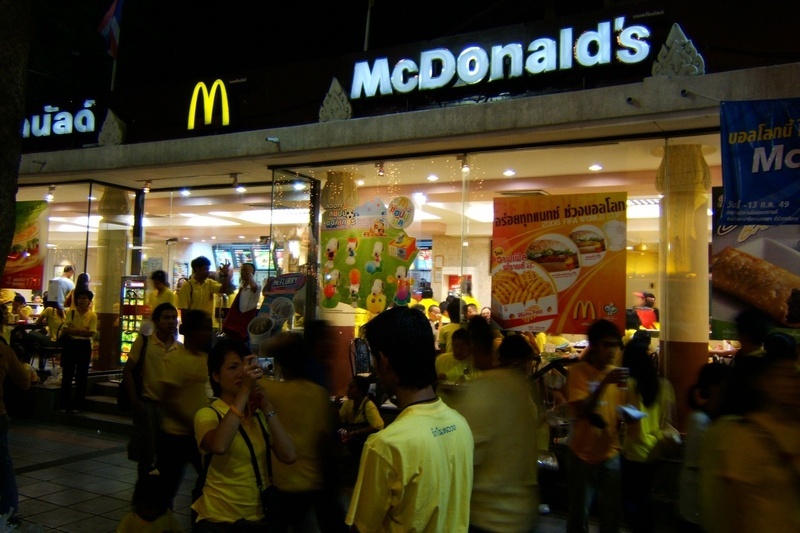 Along the way, a lone McDonalds was overrun with hungry, yellow-shirted subjects. After the ceremony at Sanam Luang concluded and before the concerts began, there was a spectacular fireworks display, first launched over the Grand Palace and then launched at the opposite end of Sanam Luang, surrounding the crowds with brilliant colors. With the Iron Palace and Wat Ratchanatda as a backdrop, a musical and dance performance was conducted for visiting dignitaries. 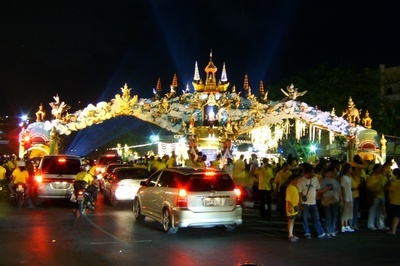 There were traditional Thai dancers, a flag squad, a 30-meter long Chinese dragon, video images projected on a water screen, live musicians, and a laser light show dancing overhead. By this point, I had cosumed my camera’s entire memory card and was hot and sweaty from several hours of traipsing around. Traffic was choked and the number of pedestrians so thick that any chance of finding a taxi or tuk-tuk was nonexistant. 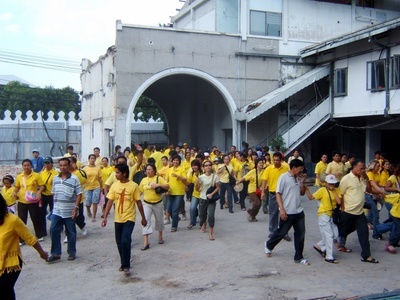 So I started walking, relying mostly on instinct and one glance at the map, weaving past Thip Sa Mai restaurant with its world-famous pad thai, across Khlong Ong Ang, and through Chinatown before finally arrived at the Hualamphong train and subway station. While I don’t feel more royal, I certainly have a deeper respect and appreciation for the King. He’s spent sixty years tirelessly working to promote the self-sufficiency of his people and sponsoring projects to help the least fortunate members of society. He’s much more sincerely committed to the welfare of people than the leaders of most other nations. It’s very inspiring.